The past couple of years have seen my attitude change a lot about pork. Not that I ever hated it but the practice of overcooking it to a dry, tough piece of meat left me wanting more…not to mention that on top of that dry meat was a big chunk of fat. Really wonderful tasting fat I might add…but one I always lopped off and threw away. You know – that ‘I won’t eat the thing I love the most cause it’s bad for me’ piece of fat? This dish was so good that I’m now soliciting strangers to come over for dinner to have an excuse to make it again. What’s changed? Well, first of all overcooking pork is no longer necessary. It used to be the healthy thing to do but the pork industry has changed their guidelines, animals are healthier and leaner and the resulting meat we get from the butcher does not have to be ‘butchered’ by us to be edible. Cooking a piece of pork until it’s still very lightly pink inside is now acceptable practice and that has made all the difference to my palate. Secondly since I’ve started to use pork more I realize just how versatile it is. Although I recently enjoyed the most amazing ribeye steak; I seem to prefer meats that lend themselves to a wide variety of spices and preparations and as a result chicken and flank steak have been my close friends for years. But I’m learning to give pork a chance and this recipe? Well, I already said it; I want it again, soon. The original recipe is from Bobby Flays ‘Grill It’ cookbook and one that he has served at his restaurant, Bar Ameracain. While I’m sure it is fabulous, no one reading this will be surprised I bet that I HAD to add a bit of rum. Full disclosure time. I don’t want everyone to visualize me like my hero in ‘Drunk Kitchen’ though; I love the booze IN the food as much as I love a good cocktail in my glass. Well, except for wine but even then, no wino here, I promise. The dish was served at the restaurant with a savory apple butter. I almost passed on it and TRUST me, so glad I did not. Pork or barbecue or even molasses not your thing? Don’t let that stop you from making the butter; it really is apple BUTTER, not apple butter made with apples! Of course it wouldn’t quite be me if I didn’t add some…come on, say it with me…RUM! The apple butter is plain out of this world. It filled two half pint jars and I’m serving it this weekend with biscuits. When I first saw how much butter was required I almost held back but so glad I did not. I have a stash of Kerrygold Butter and it was most definitely a good choice to use it for this; actually I’m sure that their butter is one reason for the outstanding end result and it deserves to be call Kerrygold Apple Butter! Really, another little jar of heaven you can plan to get in your Christmas basket this year (you know who you are!). The sage leaves were ‘just cause.’ I wanted to try something using sage from a plant in my garden that I typically don’t touch until Thanksgiving Day. They are a nice little garnish and I’m glad I tried them but they are not necessary to the overall dish being so exceptional. I think perfectly suitable to use no garnish or just some nice green parsley. 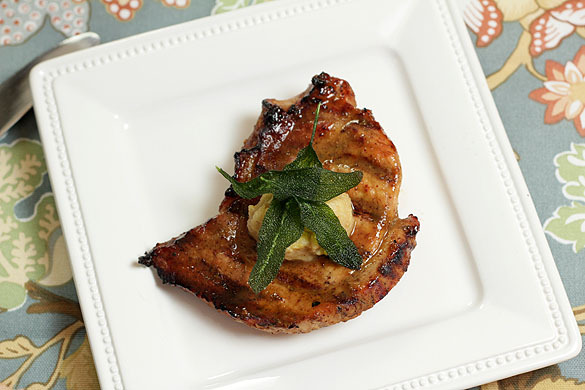 Barbecued pork with a molasses, mustard and rum glaze served with a savory apple butter and fried sage leaves. Heat the oil in a large skillet and saute the onion until soft; about 4 minutes. Add the garlic and cook for 30 seconds longer. Add the apples, brown sugar and rum and cook until the apples are soft, approximately 5-7 minutes. Add the cinnamon and salt and cook for another minute. Remove from heat and let cool. Put the mixture into a food process, add the butter and process until almost smooth (I like mine with a bit of a chunky texture). Refrigerate for at least an hour; let come to room temperature before serving. Whisk together the mustards, molasses, rum and salt and pepper to taste in a small bowl. Brush the chop on both sides with the olive oil and season with salt and pepper. Put the pork steaks on the grill and cook on one side until golden brown and slightly charred; approximately 3-4 minutes. Brush with the glaze and turn over; grill on 2nd side til done, another 4-5 minutes. Brush with the glaze on each side again, just to set the glaze, only 30 seconds per side. Check internal temp and remove at 145 degrees; tent with foil and let rest for 3-5 minutes. 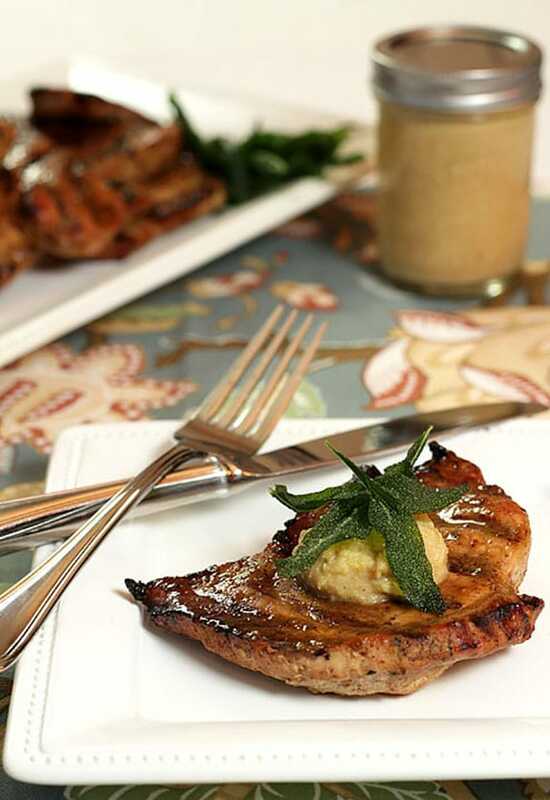 Top each steak with a dollop of the apple butter and garnish with the sage leaves. This recipe makes two half pint jars of the apple butter, more than you will need for this dish. Serve it with biscuits or alongside some squash too. What I was trying to say the first time was – I really enjoy the fact that the guidelines for cooking pork have been modified, because the only way I can enjoy it is if I undercook it (which I’ve always done). Also – I’m diggin’ the fact that you’re using what’s in your garden to add to your plate. The sage is beautiful! Lastly, you remind me that I haven’t had pork in awhile and need to get on that. I know your exasperation so it means a lot you tried again…love you for that! And me too; pork is now palatable! I don’t have a big garden anymore Kim but the herbs mean so much; I’m happy to have them everywhere. Thanks Marla…and I did; thanks for the reminder! I am so going to make that butter. I might make it tomorrow. So good Mona. Perfect with the pork but also really good with biscuits. Like I had this morning! Our local food co-op has a guy who sells pork steaks and I wasn’t sure what to do with them. But now I have a recipe to try! Looks fabulous, thanks. I’m usually happy with most things I try out…but I have to say that this was just fabulous; the perfect marriage of flavors. Hope you make it and enjoy it too…please let me know. What a lovely combination of flavours! I will have to use your glaze recipe for the chicken. I think it would work equally well with chicken…I plan to try that next time. And without a doubt there will be a next time! I never cook with pork but this molasses, mustard, rum thing you got going and with it that apple butter? Yowza!!! How’s about with chicken or veal? I make veal chops with apples and maple syrup. Barb this is one fabulous dish! I have made Bobby Flay’s molasses and Dijon pork skewers and can only imagine how good they would be with apple butter (and rum!) If you’re looking for another reason to make this, I’m free for dinner anytime. I can’t wait to try this recipe! I absolutely love pork and make a lot of different kinds of recipes with it. Your photos are gorgeous and the recipe sounds incredible. Thank you so much Andrea; it was one of those posts where it all came together for me and I’m never quite sure when I’ll hit that trifecta. I loved the recipe, the results were stellar and both light and camera were behaving! OMG. Absolutely love this. And the sage…perfect little touch! Thanks Lana; that sage frying is a bit tricky. Those little leaves fry in a second; I’m going to add a note to the post…when they say to put 15 in at a time? I think I would have had 13 burn! Recipe, flavors sound amazing, I will try it w/chicken. The vid is hilarious, never knew about the drunken’ girl. Thx for introduction. Too funny! Great idea Shulie; for years I would substitute chicken in a recipe calling for pork. Isn’t she a riot; she has a whole series of ‘drunken’ videos. She just makes me laugh so glad you enjoyed her too! This post reminded me of my mother telling us to cook our pork thoroughly otherwise we’d get worms! Not the kind of thing you want to hear to make you want to run out for a few pounds of pork chops but this recipe certainly gives me the urge to. Great looking recipe and wonderful photographs Barb. I know…and I’m sure we had to but also sure that’s why pork was never ‘the other white meat’ for me, it was simply the ‘it’s too dry to like it’ meat! And thanks Paula, you are always so kind. Wow! This has so much going on and it sounds amazing! It does seem a lot but comes together easily and was a huge hit with friends. Sort of the perfect summer dinner! Well, first off your photos are gorgeous. Secondly, your recipes just look delicious. I am a pork lover and like you am so glad that we no longer are told to incinerate it. That apple butter looks amazing. Thank you dear friend…really working hard on this photography business; changing my layout to a horizontal photo seems to be helping. HUGE change but having fun with it. Might be having some biscuits with apple butter for some bloggers I know! Thank you Winnie…although hoping one day we can lift our glasses together…yes, filled with an adult beverage of some sort! A magnificent combination of flavors! I particularly like the use of rum here. Pork and sweetness, perfect! Thank you Rosa…the rum was the perfect choice with the other ingredients. Funny, I never drink it; I just have it on hand for recipes! I have no doubt that E would love this recipe. i mean, how can you not? The rum, the sweetness… the meatiness!!!! Wonderful work, Barb! Thanks Brian…and even if you don’t do pork, you do apples, onions and butter right? You have to try the savory apple butter. So very good.